Home > About > Our Doctors > Jeffrey Joseph, M.D. Biography: Dr. Joseph is an accomplished specialist in Ophthalmic Plastic and Reconstructive Surgery. He is a member of an exclusive group of surgeons capable of providing Skin Cancer Reconstruction to sensitive areas such as the eye, upper and lower eyelids, and the brow and forehead area. It is estimated that 5-10% of skin cancers affect the eyelid; at SCARS Center, Dr. Joseph uses his talents to focus on reconstructions that give patients the best form and functionality of this sensitive area. 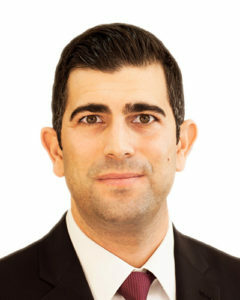 In addition to specializing in reconstructive treatment for eyelid and orbital cancers, Dr. Joseph performs the full array of medical (functional) oculoplastic surgery, including: common eyelid malpositions such as drooping of the upper eyelids (ptosis), eyelids that are turned in (entropion) or turn out (ectropion), and revision eyelid surgery to fix potential complications of prior cosmetic surgery. He also performs tear duct reconstruction to treat clogged or blocked tear ducts, and treats patients with thyroid eye disease (bulging eyes). Dr. Joseph frequently has patients referred to him by other Ophthalmologists, Plastic Surgeons and Dermatologists, who seek his expert level of training and renowned surgical outcomes. Common referrals include: Revision Eyelid Surgery, for patients who have been left with scarring; chronic dry eye, caused by inadequate eyelid surgery wherein a patient has had excessive skin removed, preventing full eye closure; and treatment for Graves’ Disease. Whether servicing patients with cosmetic procedures, non-surgical treatments, reconstructive surgeries or skin cancer treatments, Dr. Joseph will work with his patient to understand their concerns, educate them on the possibilities, and customize a plan for revision or repair. Interests: Skin cancer reconstruction of the eyelids, surgical eyelid rejuvenation, non surgical eyelid rejuvenation with Botox, filler, lasers, and peels. Dr. Joseph has been selected as Best Plastic Surgeon in Orange County two years in a row, and has been recognized as a Physician of Excellence by the Orange County Medical Association. Research: In addition to his work as an Assistant Clinical Professor at the esteemed Gavin Herbert Eye Institute, he has published over a dozen medical journals, case reports and anatomic studies. He has lectured at scientific symposiums, written articles for medical reference sites and has contributed to academic research textbooks, detailing Ophthalmological principles, techniques and applications.